On Thursday, September 10th, Grassroot Soccer South Africa received 1,000 copies of the new Skillz Coach’s DVD, which will be distributed to all Skillz Coaches as GRS rolls out the new Skillz curriculum throughout South Africa. The result of many months of scripting, filming, and editing, the Skillz Coach’s DVD represents a long-time GRS dream to create an ongoing training tool highlighting model program delivery and presenting tips for improving facilitation skills. The DVD will serve as a supplement to the Skillz Coach’s Guide and will be used in Training of Coaches courses as well as given to each Coach to take home for continued development. Special Appearances by Emmanuel Adebayor, Michael Ballack, Mabhuti Khenyeza, the Scrutinize characters, and more! GRS is infinitely grateful to local production company Substance Films, of Cape Town, South Africa, whose inspirational creativity, tireless dedication, and deep understanding of our mission brought this project to life. 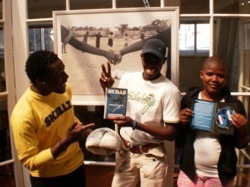 The DVD was produced with funding from USAID through GRS’ F4 South Africa project.